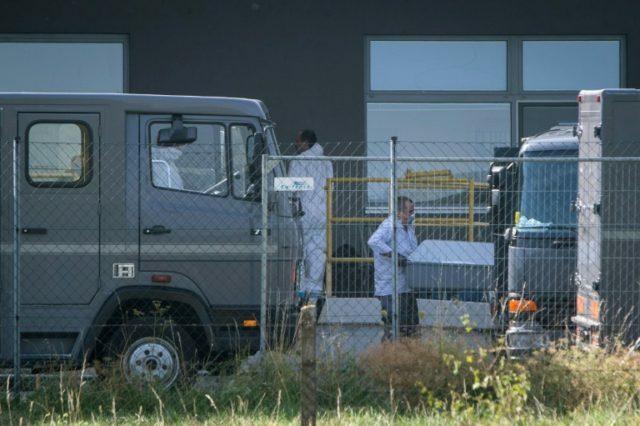 Kecskemét (Hungary) (AFP) – Nearly three years after the gruesome discovery of 71 migrants suffocated in a lorry on an Austrian highway shocked Europe, a Hungarian court is due Thursday to hand down expected heavy sentences for the traffickers. State prosecutor Gabor Schmidt has asked for life terms for four of the 14 accused, insisting that three should get life without parole under Hungarian law. The victims — 59 men, eight women and four children, including a baby — came from Syria, Iraq and Afghanistan, joining hundreds of thousands like them trying to get to Germany in 2015 at the height of Europe’s worst migrant crisis since World War II. The deaths sparked international revulsion and led a shocked German Chancellor Angela Merkel to announce she would open the country’s doors, eventually allowing in some one million refugees, mostly from Syria. Having made their way to the Serbian border with Hungary, the group of 71 were packed into the air-tight truck, their cries to stop and open the doors for fresh air ignored. The accused were charged with “aggravated murder with particular cruelty,” and went on trial a year ago in the south Hungarian town of Kecskemet. They said they had not known their human cargo was dying, although evidence was produced to say they did. But police telephone intercepts of calls made with his men on the truck asking what to do came across differently — he told them not to open the doors. When Austrian police opened the back of the lorry, they found the bodies of the migrants piled on top of each other. Hungarian officials have said the Budapest-based ring was a professional network with more than 15 vehicles used to transport refugees who were trekking up from Greece along the western Balkans to Europe. The gang had smuggled more than 1,100 people from Hungary into Austria since February 2015, charging up to 1,500 euros a head, investigators said. As well as Lahoo, the prosecutor called for life without parole for one of his closest associates and the driver of the truck, two Bulgarians, aged 31 and 27 respectively. Another Bulgarian, 40, faces a life sentence but with the possibility of parole. For the other accused, mostly Bulgarians, the prosecutor asked for up to 16 years in jail.